The Lake Pichola in Udaipur is a popular tourist destination. It is a picturesque artificial fresh water lake created in 1360 AD, and named after the nearby Picholi Village. It is one of the many beautiful lakes in and around the beautiful city of Udaipur. Jag Niwas and Jag Mandir are two famous islands located within this picturesque lake. The islands have been developed with several elegant palaces that provide the scenic views of the lake. Mohan Mandir and Arsi Vilas are two other islands on the Lake Pichola. The Jag Niwas Island is the site for the famous Lake Palace, and the Jag Mandir Island is the site for the Jag Mandir Palace. The Mohan Mandir Island is the site from where the king used to watch the annually celebrated Gangaur festival. Arsi Vilas Island also a small palace was built by Maharanas with purpose to enjoy the picturesque sunset view over the lake. Swaroop Sagar Lake and Fateh Sagar Lake are connected with the Lake Pichola. On the eastern bank of the Lake Pichola there is located the City Palace Complex. The magnificence of the picturesque Lake Pichola, positioned in the heart of Udaipur city, has not alienated anyone to fascinate towards it. The lake appears more charming and captivating with its picturesque surroundings. Maharana Udai Singh must have been spellbound by the exquisiteness of the pristine lake with the impeccable backdrop of lush green hills as when he founded the lovely city of Udaipur, he enlarged this lake. He also built a dame made in stone that falls under the “Badi Pol” region on the banks of this pristine lake. Encased by pompous palaces, terrific temples, beautiful bathing ghats, and elevated hills on all its dies, the Pichola Lake in Udaipur is indeed a must visit place. 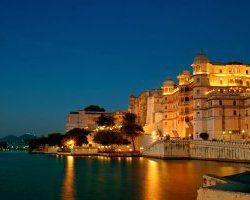 With too many attractions at and around, the Lake Pichola has been one of the most visited and sought after tourist attractions of Udaipur sightseeing tour. There are a number of palaces, temples, gardens and attractions around the Lake Pichola you can see on your visit. The City Palace, located on the eastern bank of the lake. The Lake Palace, located on the Jagniwas Island in the middle of the lake. The Jag Mandir Palace, located on Jag Mandir Island in the lake. Boat ride on the Lake Pichola. Arsi Vilas Island, a sanctuary for birds. Sita Mata Game Sanctuary on the western sore of the lake.